The NSG3040 system is designed to fulfil conducted EMC test requirements for CE mark testing and includes generally combination wave, EFT pulses and PQT. Extensive expansion capabilities enable the system to be configured for a much broader range of applications. The easy to use and convenient multifunction generator to simulate electromagnetic interference effects for immunity testing in conformity with international, national and in-house standards including the latest IEC/EN standards. 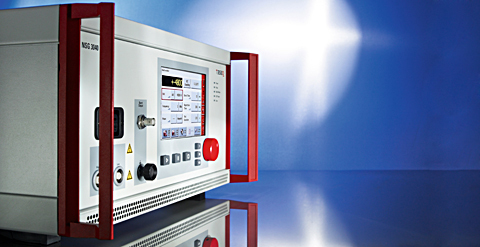 The NSG 3040 completes the multifunction generator family with the new Teseq design philosophy. This innovative design is based on modular architecture to provide a versatile system, that can be configured for basic testing needs and expanded to meet the needs of sophisticated test laboratories. Using state-of-the-art components, the selfcontained modules set new standards with respect to switching and phase accuracy and exceed the existing standards’ requirements. Along with the well proven and unique “Master-Slave” concept technology, enables individual pulse modules to be calibrated separately with the calibration data and correction factors stored on the module itself, in the slave controller. The integration of a high quality and large 7'' color touch panel display with superb contrast makes the control of the NSG 3040 easy. Depending on requirements, the inputs are supported by an integrated keyboard, or by using a wheel with additional keys for sensitivity adjustment. Each parameter’s value is highly visible and all settings can be quickly selected and modified with the generously sized touch input buttons. A stylus is not necessary, and ramp functions are programmed quickly and easily. Multi-step test procedures can be created and their sequence or parameter values changed easily. Firmware downloads can be performed quickly with the easily accessible SD memory card reader. Tests specified by the user will be saved completely. The Windows software simplifies test programming and allows compiling of complex test sequences with various types of tests. Test reports can be generated during the test operation allowing the operator to enter observations as the test progresses thus increasing the efficiency of long-term tests. Producibility may be achieved in combination with a discharge removing device.